In this groundbreaking book, Martin Puchner tells the story of literature in sixteen acts - from Homer to Harry Potter, including The Tale of Genji, Don Quixote, and The Communist Manifesto, and how they shaped world history. Puchner's book leads us on a remarkable journey through time and around the globe to reveal the how stories and literature have created the world we have today. Through sixteen foundational texts selected from more than four thousand years of world literature, he shows us how writing has inspired the rise and fall of empires and nations, the spark of philosophical and political ideas, and the birth of religious beliefs. This delightful narrative also chronicles the inventions - writing technologies, the printing press, the book itself - that have shaped people, commerce, and history. In a book that Elaine Scarry has praised as "unique and spellbinding," Puchner shows how literature turned our planet into a written world. 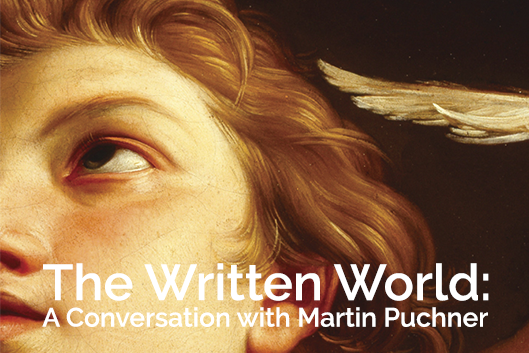 In this lunchtime conversation, Martin Eisner, Katharine Brophy Dubois, and Helen Shears will join Martin Puchner to discuss his work as well as the process of writing for a broader public. Free and open to the public. Light lunch served. Sponsored by the Forum for Scholars and Publics and the Humanities Futures initiative @ the Franklin Humanities Institute.